Taal Lake, formerly known as Bombón Lake, is a freshwater lake in the province of Batangas, on the island of Luzon in the Philippines. The lake fills Taal Caldera, a large volcanic caldera formed by very large eruptions between 500,000 and 100,000 years ago. It is the country's third-largest lake, after Laguna de Bay and Lake Lanao. Volcano Island, the location of Taal Volcano's historical eruptions and responsible for the lake's sulfuric content, lies near the center of the lake. There is a crater lake on Volcano Island. Known as the Yellow Lake or the Main Crater Lake, it contains its own small island, Vulcan Point. Vulcan Point was thought to be the largest third-order island in the world, but Treasure Island (Ontario) is much bigger and is thought to be the world largest, and is also on a freshwater lake. The Taal Lake basin was first declared as a national park, the Taal Volcano National Park, by Proclamation No. 235 on July 22, 1967 covering 62,292 hectares (153,930 acres). Under Republic Act 7586, otherwise known as the National Integrated Protected Areas System (NIPAS) Act of 1992, the area was reestablished as the Taal Volcano Protected Landscape by Proc. 906 on October 16, 1996. The protected area is managed by a Protected Area Management Board (PAMB) and has a Chief Operating Officer called a Protected Area Superintendent. A Management Plan was crafted and approved by the PAMB in 2009 and now serves as the blueprint for lake conservation. Taal Lake was once an inlet of nearby Balayan Bay, and was easily navigable from it. A series of major eruptions in the early 18th century battered the lakeside towns with earthquakes and volcanic debris. The activity culminated in 1754 with Taal Volcano's largest eruption that blocked Pansipit River with tephra, blocking the lake's sole outlet to the sea. This caused the waters to rise, eventually submerging several lakeside towns – the remnants of which are reportedly visible underwater to this day. Since the 1754 eruption, the surface elevation had risen from sea level to 5 metres (16 ft) above sea level, with the lake's once saline waters becoming freshwater after centuries of precipitation. The poblaciones (town centres) of Lipa, Taal, Sala, Bauan, and Tanauan were abandoned and reestablished several kilometers away from the lakeshore after volcanic activity had subsided. Over a century hence, newer settlements along the lakeshore were carved from the larger towns: Talisay (established 1869, from Taal), Cuenca (1877, from San José), Alitagtag (1910, from Bauan), Mataasnakahoy (1932, from Lipa), Agoncillo (1949, from Lemery), San Nicolas (1955, over the ruins of old Taal), Laurel (1961, from Talisay), Santa Teresita (1961, from Taal, San Luis, and San Nicolas) and Balete (1969, from Lipa). As the lake was previously connected to the sea, it is home to many endemic species that have evolved and adapted to the desalination of the lake's waters. The lake has a freshwater-adapted population of trevally, Caranx ignobilis. This fish, also found in Pansipit River, is locally called maliputo. Its most popular endemic species is the overharvested Sardinella tawilis, a freshwater sardine. The two other endemic fish species in Taal Lake are the gobies Gnatholepis volcanus and Rhinogobius flavoventris. Taal Lake is also home to one of the world's rarest sea snakes, Hydrophis semperi. This particular species is only one of two "true" sea snake (Hydrophiinae) species that are known to live entirely in freshwater (the other is Hydrophis sibauensis from the Sibua River, Borneo, Indonesia ). Bull sharks, Carcharhinus leucas, used to be part of the lake's once-diverse ecosystem but were extirpated by the locals by the 1930s. Jaguar guapote (Parachromis managuensis), a predatory piscivore, a carnivorous fish that primarily eats other fishes, was found illegally introduced into the lake. The alien fish could proliferate in all areas of lake because of the abundant aquatic vegetation which they use for spawning and feeding, plenty of natural food, and favorable warm environment. Its presence could seriously affect the native fish population. On January 5, 2008, the Bureau of Fisheries and Aquatic Resources announced that a fish kill at Taal Lake (January 2 to 4) caused the 50 metric tons or ₱3.25-million ($79,268) loss of cultured tilapia in the villages of Leviste and Balakilong in Laurel and in Barangays Aya and Quiling in Talisay. 6,000 maliputo fishes ($5,609) also died at Quiling. Toxic sulfur and high level of hydrogen sulfide in Ambulong while low dissolved oxygen caused the deaths. On May 30, 2011, the Bureau of Fisheries and Aquatic Resources announced a fish kill of 750 metric tons. According to the scientists, the onset of the rainy season brought a sudden drop on the water temperature, which lowered the oxygen levels on the lake. Regular tours of the lake are available to tourists. After crossing the lake, visitors travel to the top of Volcano Island on horseback. During their trip up and down the mountain, visitors are treated to a stunning view of the lake and its surroundings. Tagaytay in Cavite has benefited from Taal Lake and Taal Volcano, which is administered by neighboring province of Batangas. Many tourists has visited Tagaytay for a panoramic view of the lake and volcano. In mid-2007, controversy ensued when the Korean firm Jung Ang Interventure was given clearance to build a health spa on Volcano Island itself along the lake's edge. Over the course of the next few weeks, several government officials expressed their disapproval of the construction project. On June 28, the DENR suspended the Korean firm's environmental clearance certificate, rendering them incapable of pursuing further construction on the island until they secure other necessary permits. Because of the unpopular public reaction to the project, the Korean company's permit was permanently revoked by the DENR in early July 2007. ^ a b "Lake Taal" Archived 2012-03-06 at the Wayback Machine. International Lake Environment Committee. Retrieved on 2012-03-17. ^ Sawyer, Frederic H. (1900-01-01). The Inhabitants of the Philippines. Library of Alexandria. ISBN 9781465511850. ^ Crossley, Professor John Newsome (2013-07-28). Hernando de los Ríos Coronel and the Spanish Philippines in the Golden Age. Ashgate Publishing, Ltd. ISBN 9781409482420. ^ U.S. Army Corps of Engineer (1954). 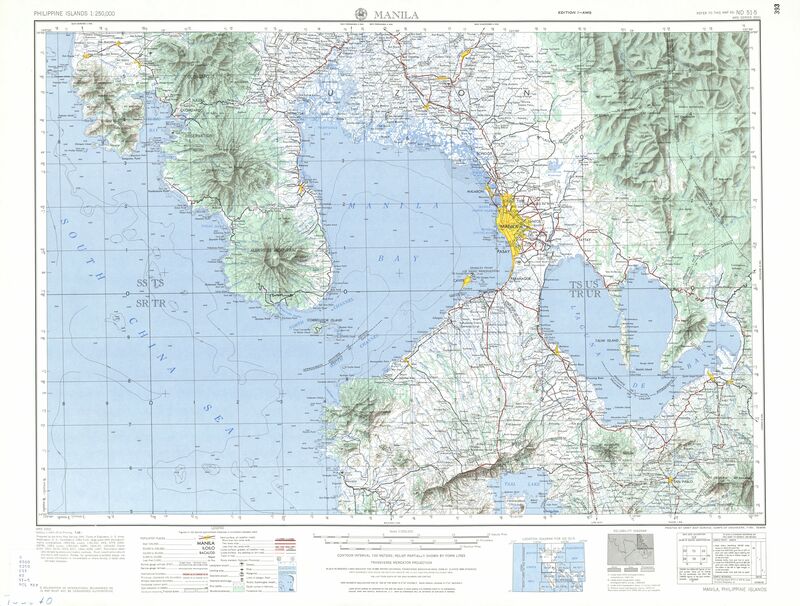 "Manila (Topographic map)". University of Texas in Austin Library. Retrieved on 2014-08-03. ^ "List of initial components of Nipas Act" Archived 2013-10-04 at the Wayback Machine. Protection and Wildlife Bureau. Retrieved on 2012-01-13. ^ "Protected Areas in Region 4-A (CALABARZON)" Archived 2014-02-02 at the Wayback Machine. Protection and Wildlife Bureau. Retrieved on 2012-01-13. ^ (2003). "Taal flyer - Chronology of Historical Eruptions of Taal Volcano". PHIVOLCS. Retrieved on 2014-08-03. ^ Hargrove, Thomas (1991). "The Mysteries of Taal, a Philippine volcano and lake, her sea life and lost towns". Bookmark, Manila. ISBN 971-569-046-7. ^ betaxfer1 (2012-12-08). "The Mysteries of Taal Pt.1 - Thomas Hargrove from Pep Talk w. Loren Legarda". YouTube. Retrieved on 2014-08-03. ^ "Alitagtag, Batangas History". Wow Batangas. Retrieved on 2014-08-03. ^ "History". Talisay, Batangas Official Website. Retrieved on 2014-08-03. ^ Froese, Rainer and Pauly, Daniel, eds. (2012). "Gnatholepis volcanus" in FishBase. November 2012 version. ^ Froese, Rainer and Pauly, Daniel, eds. (2012). "Rhinogobius flavoventris" in FishBase. November 2012 version. ^ Rasmussen, A. 2010. Hydrophis sibauensis. The IUCN Red List of Threatened Species 2010: e.T176710A7287960. Downloaded on 06 August 2018. ^ (2006). "Biological Investigation of Jaguar Guapote Parachromis managuensis (Gunther) in Taal Lake, Philippines" Archived 2012-05-02 at the Wayback Machine. Journal of Environmental Science and Management, Vol 9, No 2. ^ Luistro, Marlon Alexander (2008-01-05).Inquirer.net, "Taal Lake fishkill causes ₱3-M losses" Archived 2008-01-17 at the Wayback Machine. Philippine Daily Inquirer. Retrieved on 2011-01-15. ^ Celis, Noel (2011-05-30). "Philippines struggles under mountain of dead fish". AFP. Retrieved 2011-05-30. ^ Francisco, Butch (25 October 2011). "How the Taal brouhaha started". The Philippine Star. Retrieved 26 November 2016. ^ Ramos, Marlon (2007-06-25). "Batangas, Tagaytay execs oppose Taal spa project". Breaking News: Regions. Inquirer.net. Retrieved 2007-07-08. ^ Torres, Tetch (2007-06-27). "Vilma Santos takes oath, says vs Taal spa". Eleksyon 2007 Special Coverage. Inquirer.net. Archived from the original on 2008-06-04. Retrieved 2007-07-08. ^ Contreras, Volt (2007-06-30). "DENR gives Taal spa firm 1-week ultimatum". Headlines: Nation. Inquirer.net. Archived from the original on 2008-06-04. Retrieved 2007-07-08. ^ Andraneda, Katherine (2007-07-06). "DENR cancels Taal spa permit" Archived 2011-10-07 at the Wayback Machine. Philippine Headline News Online. Retrieved on 2011-01-15. Wikimedia Commons has media related to Taal Lake. Mysteries of Taal. Author Thomas Hargrove talks about the 1754 eruption that changed Taal Lake. Trek to Taal Volcano. Guide to Taal Lake from Philippine Journeys.